How to Wear Bight Jeans This Summer! Stephanie says, "I love wearing colored denim because it allows me to play around with a traditional material. All of the different rainbow colors stand out from the crowd and I love wearing brighter colors when the weather's warmer. It's such a fun spring trend! It's always tricky matching a top with colored denim, but I try to pick something that has all different colors including the color of my jeans. I always make sure the colors I'm pairing together never clash!" Jessi says of her look: "Why not mix up your wardrobe with some bright and colorful denim? I got these turquoise shorts from Brandy Melville in SoHo and paired it with a simple white tank making for a cute, bright and summery look!" See more Bright Jeans in our look book. 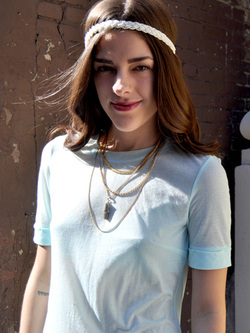 See How the Style Council Accessorizes Their Summer Tees! Dressing up a basic is easy. All you need is a few necklaces, a pop of color, or a sheer cover-up. Steal their tricks to update your style this summer. This summer I'm all about pastel shades and light materials. When accessorizing a summer tee, I like to layer tons of cute necklaces and a hairpiece to make a simple look a little more exciting! This tee is from H&M and the hairpiece is from Forever 21. The necklaces are ones my mom had collected over the years." Diandra"For my summer tee look, I kept my accessories fairly simple. Taking color cues from the top, I opted for bright, red denim, subtle orange sandals, and kept everything else neutral. My biggest tip for accessorizing and styling a summer tee is to embrace color. If you can't decide between a pair of regular blue denim shorts and a pair of bright neon ones — go with the neon! Trends come and they go, playing it safe is never any fun in fashion.